The two were wed in Chicago at Montrose Harbor in an afternoon ceremony. 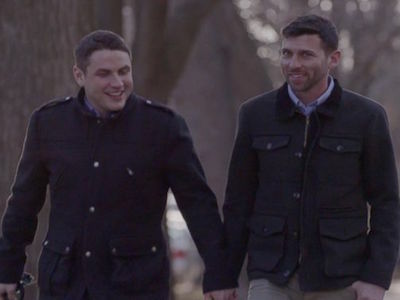 Jared Milrad and Nathan Johnson, the gay couple featured in Hillary Clinton's presidential campaign announcement video to show her support for marriage equality, tied the knot over the weekend. Clinton did not attend. The two were wed Sunday in Chicago at Montrose Harbor on Lake Michigan in an afternoon ceremony and shared photographs of the ceremony on Instagram and Twitter. As The Advocate reported in May, he footage for their segment of the video was filmed just outside their apartment in Chicago, where Milrad, 31, works as an attorney and social entrepreneur who founded the nonprofit Civic Legal Corps, and Johnson, 30, works as a project manager for a health care consulting company. After the video was released, the men invited Clinton to attend over Twitter. Staff replied to the two immediately, but she declined the invite, saying her presence would take the focus off their ceremony and would turn it into a media feeding frenzy. Instead, the presidential candidate sent them a warm, congratulatory note. You can watch video of the ceremony below from Chicago TV station WBBM .